The National Institutes of Health’s (NIH) All of Us Research Program (formerly the Precision Medicine Initiative Cohort Program) within NIH Office of the Director has issued a new funding opportunity for organizations interested in helping engage volunteers. The funding opportunity is open to national and regional organizations, as well as local community groups. The program is designed to support activities to promote enrollment and retention in the All of Us Research Program across diverse communities. All of Us, unlike the majority of NIH-supported research, is not focused on a particular disease or population. The program is intended to “serve as a national research resource to inform thousands of studies, covering a wide variety of health conditions.” The agency plans to launch the All of Us program later this year. 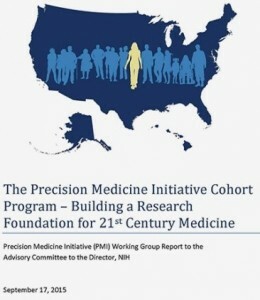 On September 17, the National Institutes of Health (NIH) Advisory Committee to the Director (ACD) presented its recommended design framework for building a national research participant group, or “cohort,” of one million or more Americans, that would be part of the President’s proposed Precision Medicine Initiative (PMI) (see Update, April 21, 2015 and June 15,2015). The National Institutes of Health (NIH) is seeking feedback from the scientific community regarding using mobile Health (mHealth) technologies for the Precision Medicine Cohort. The agency points out that the collection of health and lifestyle data on “participant volunteers” have generally come from medical records and extensive phone or paper surveys. The agency will collect feedback on the topics through July 24, 2015 on the NIH’s website.